G-Land is a magical place and one of the surfing world’s most increadible surfing destinations. For many surfers, its been a very special surfing site of primitive beauty and perfect waves. Secluded situated at Plengkung on the Southern tip of peninsula of Java is the legendary Grajagan. This remote little camp on the edge of Plengkung jungle conveniently situated in Banyuwangi, Eastern Java Province has earned a big reputation among nomadic surfers all over the world. Like primitive magical sound of its name, the mentions of Grajagan is an Indonesia incatation that causes surfers everywhere gaze longingly at the horizon. 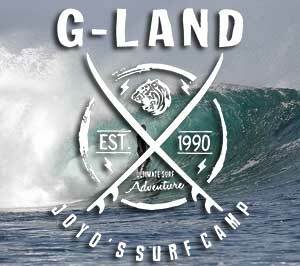 More About G-Land Joyos Surf Camp Indonesia.